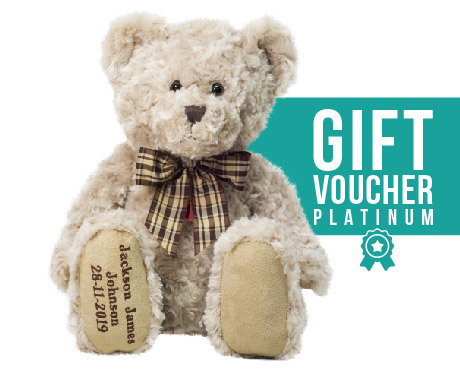 When you purchase this Gift Voucher the recipient will be able to go online and add their own message to their very special bear. The gift voucher includes PLATINUM SERVICE PRODUCTION AND DELIVERY. This Gift Voucher enables the recipient to redeem any one of our range of My Birthday Teddy bears. Standing approx 50cm tall (32cm sitting), our bears are finished by hand with great care. Add a personalised message with name and birth date or your only special message. A My Birthday Teddy bear is the perfect gift for any “special” occasion!! Your teddy will arrive beautifully wrapped in tissue paper and packaged in a special box. Your teddy will be delivered within Australia in 5 to 10 days.